Herodotus of Halicarnassus (in Greek, Ἡρόδοτος Ἁλικαρνᾱσσεύς, Herodotos Halikarnasseus) was a Dorian Greek historian who lived in the 5th century BC ( 484 BC–ca. 425 BC) and is regarded as the "father of history". He is almost exclusively known for writing The Histories, a collection of 'inquiries' (or 'ἱστορίαι', a word which passed into Latin and took on its modern connotation of 'history') about the places and peoples he encountered during his wide-ranging travels around the Mediterranean. The theme for this work was the conflict between the ancient Greeks and the Persians or ' Medes'. The first six books deal broadly with the growth of the Persian Empire. The tale begins with an account of the first 'western' monarch to enter into conflict with a 'eastern' people— Croesus of Lydia attacked the Greek city-states of Ionia, and then (misinterpreting a cryptic oracle), also attacked the Persians. (As occurs many times throughout The Histories to those who disregard good advice, Croesus soon lost his kingdom, and nearly his life). Croesus was defeated by Cyrus the Great, founder of the Persian Empire, and Lydia became a Persian province. It is possible to see the dialectic theme of Persian power and its various excesses running like a 'red thread' throughout the narrative— cause and effect, hubris and fate, vengeance and violence. Even the strange and fantastic tales that are liberally sprinkled throughout the text find their source in this momentum. At every stage, a Persian monarch crosses a body of water or other liminal space and suffers the consequences: Cyrus attacks the Massagetae on the eastern bank of a river, and ends up decapitated; Cambyses attacks the Ethiopians to the south of Egypt, across the desert, and goes mad; Darius attacks the Scythians to the north and is flung back across the Danube; Xerxes lashes and then bridges the Hellespont, and his forces are crushed by the Greeks. Thus, though he strays (and sometimes strays rather far) off of this main course, he always returns to the task at hand—answering the question, how and why did the Greeks and Persians enter into the greatest conflict then known, and what were the consequences? 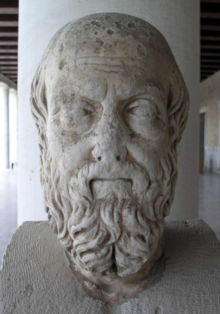 Discoveries made since the end of the 19th century have helped to rehabilitate Herodotus' reputation a great deal. The archaeological study of the now submerged ancient Egyptian city of Heraklion and the recovery of the so-called ' Naucratis stela' lends substantial credence to Herodotus' previously unsupported claim that Heraklion was founded under the Egyptian New Kingdom. . Because of this recent increase in respect for his accuracy, as well as the quality and content of his observations, Herodotus is now recognized as a pioneer not only in history, but in ethnography and anthropology as well.